For other ships with the same name, see USS Cole. USS Cole (DDG-67) is an Arleigh Burke-class Aegis-equipped guided missile destroyer homeported in Naval Station Norfolk, Virginia. Cole is named in honor of Marine Sergeant Darrell S. Cole, a machine-gunner killed in action on Iwo Jima on 19 February 1945, during World War II. Cole is one of 62 authorized Arleigh Burke-class guided missile destroyers, and one of 21 members of the Flight I-class that utilized the 5 in (130 mm)/54 caliber gun mounts found on the earliest of the Arleigh Burke-class destroyers. The ship was built by Ingalls Shipbuilding and was delivered to the Navy on 11 March 1996. On 12 October 2000, Cole was the target of a terrorist attack carried out by al-Qaeda in the Yemeni port of Aden, when two suicide bombers detonated explosives carried in a small boat near the warship, killing 17 sailors, injuring 39 others, and damaging the ship. On 29 November 2003, Cole engaged in her first overseas deployment after the bombing and subsequently returned to her homeport of Norfolk, Virginia, on 27 May 2004 without incident. Cole was launched on 10 February 1995 and commissioned on 8 June 1996. Cole was in continual service for the United States Navy for several years after being commissioned. However, an al-Qaeda terrorist attack in 2000, allegedly plotted by Khalid Sheikh Mohammed, would heavily damage the ship, requiring extensive repairs, although still capable of eventually returning to service. The first seven months of 2000 were spent completing the Intermediate and Advanced portions of the Inter-Deployment Training Cycle (IDTC). From 7 March to 7 April, Cole participated in Composite Training Unit Exercise (COMPTUEX) 00-2 as part of Cruiser-Destroyer Group 2, led by the aircraft carrier George Washington, operating within the Gulf of Mexico operating areas. Cole was the only unit not 'damaged' during the exercise. From 9 to 22 May, Cole participated in Joint Task Force Exercise 00-2 with the battle group, operating within the Cherry Point and Virginia Capes Operating Areas. On 8 August 2000, Cole departed on deployment, spending much time in the Mediterranean and Adriatic. USS Cole being carried by MV Blue Marlin. USS Cole in April 2002. On 12 October 2000, while at anchor in Aden, Cole was attacked by Al-Qaeda suicide bombers, who sailed a small boat near the destroyer and detonated explosive charges. The blast created a hole in the port side of the ship about 40 feet (12 m) in diameter, killing 17 crewmembers and injuring 39. The ship was under the command of Commander Kirk Lippold. Eleven seriously injured sailors (2 women and 9 men), were evacuated to various hospitals in Aden by French Air Force C-160 Transalls from the French Forces of Djibouti. French forces were mobilized to treat the wounded. They were evacuated by a USAF McDonnell Douglas C-9 thereafter. Cole was returned to the United States aboard the Dutch heavy-lift vessel Blue Marlin owned by Dockwise of the Netherlands. The ship was off-loaded 13 December 2000 from Blue Marlin in a pre-dredged deep-water facility at the Pascagoula, Mississippi, shipyard of Northrop Grumman Ship Systems, Ingalls Operations. On 14 January 2001, Cole was moved from the floating dry dock at Litton Ingalls Shipbuilding to the land facility in order to fully begin its restoration process. Cole's movement over land was accomplished by a system of electrically powered cars that travelled over rails. Cole was moved to a construction bay near where the ship was originally built five years before. On 1 July 2001, still under repair, Cole was transferred to Carrier Group 2, led by the aircraft carrier Harry S. Truman. On 14 September 2001, Cole was moved from drydock into the water once again. The transfer, originally scheduled for 15 September, was done secretly the night of 14 September in order to avoid the large media event originally scheduled one month prior to the September 11 attacks. The process of moving the ship from the dry dock to the water took approximately eight hours. As part of the increased security surrounding the undocking, sister ship Bulkeley provided weapons and a physical presence to deter the possibility of any type of militant activity during the move. After 14 months of repair, Cole departed on 19 April 2002, and returned to her homeport of Norfolk, Virginia. On 3 December 2001, Cole transitioned from Destroyer Squadron 22, to COMDESRON 18 and the Enterprise Battle Group. The move to CDS 18 was followed by a visit to Cole by Commodore Daniel Holloway, Commander, Destroyer Squadron 18, on 10–11 December 2001. The U.S. government offered a reward of up to $5 million for information leading to the arrest of people who committed or aided in the attack on Cole. Al-Qaeda was suspected of targeting Cole because of the failure of a 3 January 2000 attack on the destroyer The Sullivans, one of the 2000 millennium attack plots. On 4 November 2002, Qaed Salim Sinan al-Harethi, a suspected al-Qaeda operative, who is believed to have planned the Cole attack, was killed in Yemen by the CIA using an AGM-114 Hellfire missile launched from an MQ-1 Predator drone. On 20 August 2003, Cole got underway with the Argentinian destroyer Sarandí for a short group sail. Embarked onboard Cole was the Visit Board Search and Seizure (VBSS) Team from the destroyer Thorn. Together with Cole's two VBSS teams they conducted a series of Maritime Interdiction Operation (MIO) boardings on both Cole and Sarandí to practice for the upcoming COMPTUEX. On 21 August, Cole fired CIWS and 5-inch rounds during a Killer Tomato Exercise in addition to conducting a series of personnel transfers with Sarandí via Sarandí's helicopter. Three of Cole's officers had an opportunity to experience life aboard Sarandí for a few hours, while three of their officers had the same opportunity on-board Cole. The destroyer Gonzalez joined the group to conduct their own MIO boardings and on the 22 August, all three ships conducted an underway replenishment with the supply vessel John Lenthall before heading back to Norfolk. The predeployment Composite Training Unit Exercise (COMPTUEX) tested Cole's crew and all of the Enterprise Strike Group from 10 September 2003 until the beginning of October, the first part which was a series of structured events. On the first day Cole's CIC teams participated in a jamming exercise, demonstrating for many new watch-standers the effects on Cole's sensors while being jammed. The next day Cole was briefly called away from the exercises to help a distressed vessel, providing 75 gallons of fuel to Motor Vessel Kimberly L., allowing her to get back to shore safely. Later that day Cole set up for two boardings of the fleet tug Apache, which were cancelled due to inclement weather. On 29 November 2003 Cole deployed for her first overseas deployment after the bombing. December began with Cole in company with fellow destroyers Gonzalez and Thorn, transiting the Atlantic Ocean for the deployment of Cruiser-Destroyer Group 12, the Enterprise strike group. On 1 December, all three ships conducted an underway replenishment with the supply vessel Arctic, the Surface Strike Group's last fuel stop until reaching Europe. She subsequently returned to her homeport of Norfolk, Virginia on 27 May 2004, without incident. In 2005 Cole participated in Exercise BALTOPS 05 in the Baltic Sea. Cole returned to the U.S. in early July and was able to attend Fourth of July Celebrations in Philadelphia. Cole deployed to the Middle East on 8 June 2006, for the first time since the bombing. While passing the port city of Aden the crew manned the rails to honor the crewmembers killed in the bombing. She returned to her homeport of Norfolk on 6 December 2006, again without incident. On 21 August 2006, the Associated Press reported that Cole's commanding officer at the time of the bombing, Commander Kirk Lippold, was denied promotion to the rank of Captain. On 28 February 2008, Cole was sent to take station off Lebanon's coast, the first of an anticipated three-ship flotilla. On 3 February 2017, a U.S. defense official told Fox News that "The Navy sent the USS Cole to the Gulf of Aden following an attack earlier this week [30 January] on a Saudi warship off Yemen by Iranian-backed Houthi rebels". Both Iran and the Houthis have denied they are collaborating with each other. On 12 November 2009, the Missile Defense Agency announced that Cole would be upgraded during fiscal year 2013 to RIM-161 Standard Missile 3 (SM-3) capability in order to function as part of the Aegis Ballistic Missile Defense System. ^ a b "Yemeni pair charged in USS Cole bombing". CNN. Archived from the original on 4 December 2007. ^ "Destroyer Photo Index DDG-67 USS Cole". NavSource Naval History. Retrieved 20 June 2015. ^ "Attack on the USS Cole". al-bab.com. Archived from the original on 15 June 2015. Retrieved 20 June 2015. ^ "Cole Skipper Off Promotion List". Military.com. Associated Press. 22 August 2006. Retrieved 20 June 2015. ^ "USS Cole off Lebanon Coast; Show of Support to Whom?". al-manar.com. 29 February 2008. Archived from the original on 7 March 2008. ^ "USS Cole patrolling off Yemen after Iran-backed rebels attack Saudi ship". fox news. 3 February 2017. ^ "Yemeni rebels deny US charges that Iran is arming them". Retrieved 14 October 2018. ^ Arab, The New. "Iran 'strongly denies' arming Yemen Houthi rebels". alaraby. Retrieved 14 October 2018. 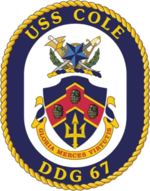 Wikimedia Commons has media related to USS Cole (DDG-67). This page was last edited on 9 April 2019, at 09:21 (UTC).